KITT Turns Into A Woman For Knight Rider Video With Dale Earnhardt Jr.
There’s been talk of a new Knight Rider movie for what feels like forever, even though a number of reboots have failed to capture an audience, any audience. It seems like one of those properties that, though there is nostalgia for it, it’s not necessarily the kind that translates into ratings. The most recent reports we’ve heard have a movie with Chris Pratt and Danny McBride attached to star. This will be the kind of ironic, comedic take this kind of property seems to attract (do we really need another Starsky and Hutch? ), and we’ll have to see how it goes now that Pratt is becoming a huge movie star and has commitments to Guardians of the Galaxy and Jurassic World moving forward. Until this materializes, however, Funny or Die has their own take on the 1980s camp classic. This is definitely a different version of the dynamic you’re used to seeing in reruns. Not only does NASCAR driver Dale Earnhardt Jr. play Michael Knight, not David Hasselhoff, but his famous talking car, the Knight Industries Two Thousand, aka KITT, is something else entirely. Gone is the sarcastic, adventurous KITT of the past, replaced by a whiny, needy, co-dependent vehicle that needs daily affirmations, constant reassurance, and just doesn’t always have the drive necessary to chase down bad guys. It doesn’t help matters that it also appears to have a phobia of travelling at any great speed, which is a problem when you’re a car designed for hot pursuit. This is a nice balance of a funny concept, and they also manage to get in, get what they can out of it, and get out before they overstay their welcome. You can feel it stretching at the end, and this video is only two-minutes long. So many similar videos start out strong, but keep going far too long, hammering the point home, and wind up more annoying and obnoxious than humorous. 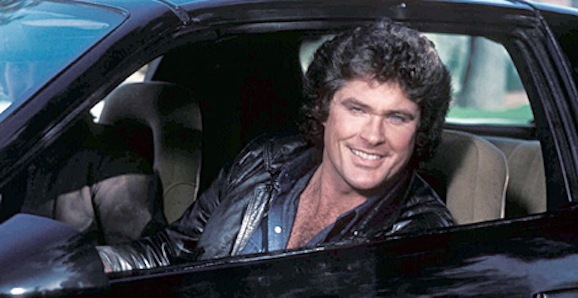 Is anyone out there really interested in a new Knight Rider movie? This is a legitimate question. It’s one of those shows that I loved as a kid and have fond memories of, but I never need to watch it again, because it doesn’t hold up, at all. Shows from this era that rely on advanced, futuristic technology for their premise, started to feel dated even a few years after their original runs (Airwolf is another show I adored that aged terribly). As I said earlier, there have been a number of reboots and sequels already, all of which take a serious approach, and all of them failed. A funny movie is the next logical option, but at this point, will they be able to bring anything new to the table, anything that makes it worth watching? It’s hard to imagine a version of that ilk being anything but a tired retread full of the same ‘80s jokes we’ve heard thousands of times at this point. Do you want a Knight Rider movie? Do you think there’s a way, serious or funny, that they could pull off something worth watching? This Samsung commercial may be the best Knight Rider we’ve seen since the original.